Weeks apart, Toby and Kelly both managed to scare me half to death thinking that their feet were bleeding. I’m sure unintentionally, they taught me a good lesson about how to respond to a medical emergency, whether real or perceived. Toby took the first round, I had just put a plate of cucumber mush into their cage, she hopped on the plate, and then jumped back off. As she bounced around the cage I saw a bright red, wet dot on her toe! 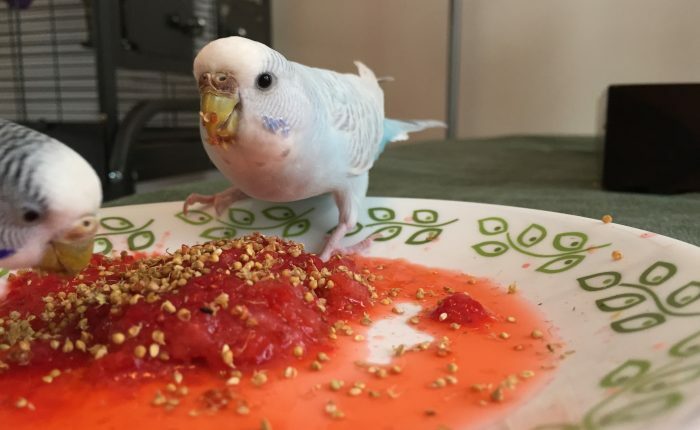 Now, mind you I have no idea how a parakeet could cut their foot on a plate of grated cucumber mush, but if anyone was going to find a way it would be Toby. That girl trips all over her own feet every day. Anyway, I immediately went to level 10 on the panic scale, like most parakeet owners, I’ve heard the statistic that ‘keets can die from losing just 12 drops of blood, and this looked like bit fat drop number 1! I yelled out to my husband that he needed to come immediately because Toby’s foot was bleeding, he leapt off the couch and joined me in the kitchen and reminded me that I should grab my Styptic Powder from our 1st aid kit. I was literally in such a state I don’t know if I would have gotten that far, so much for being calm in a crisis! I grabbed the powder and ripped open the package, quickly reading the directions as I went. But, as my initial panic was fading, I noticed that the drop of blood hadn’t changed on Toby’s foot, or fallen off or anything, which seemed pretty suspicious. Pointing it out to Patrick, we decided that since she wasn’t in immediate danger of exsanguinating we should get her to wash her foot off and see what the heck was going on. I poured a shallow dish of water and we lured her in to splash around with some millet. As soon as she hopped in the water the red dot floated away and there was nothing at all wrong with her toe underneath! Huge sigh of relief, but what the heck was it in the first place?? I poured out some of their food on a white piece of paper and noticed that here and there were tiny pieces of something red which were clearly the culprit! It makes so much sense now, that she got her foot wet in the cucumber and then, hopping onto the papered floor of their cage, got a small bit of discarded food stuck to her toe! It just happened to be colored for maximum bird mommy panic. Sidebar, the reason I’m so susceptible to thinking their feet are damaged is because Toby and Kelly both have a tendency to bite each other’s feet. No one HAS ever actually drawn blood, but if someone’s feet look bloody that’s where my mind goes immediately and it feels so plausible. Next up, several weeks later, was Kelly. I had just woken them up for the day and saw a dried-looking patch of red on her foot that I simply could not explain. 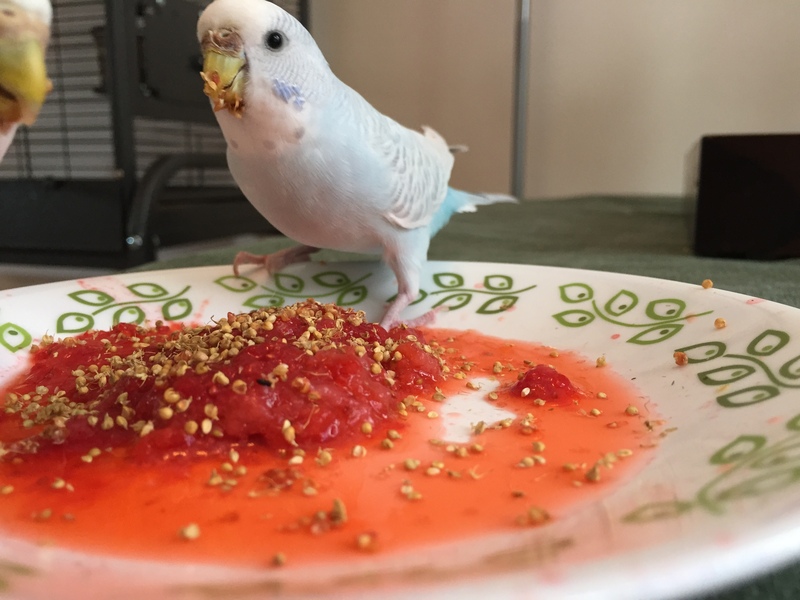 I can proudly say I reacted with somewhat less panic, but did call Patrick over and instead of grabbing the styptic we first went for the plate of water and millet trick. She happily splashed around for a few moments and the red splotch faded, to my great relief. Then I remembered that I had fed her strawberries for the first time the previous evening and it looked like a total bloodbath! I didn’t notice any stains on her foot at the time, but I had noticed the tip of her tail and her head had a couple of red marks, so I must have just missed the foot splash. The lesson learned here, for me, is twofold. First it reinforces how important it is to have first aid supplies on hand. But second, and most important, it reminds me that keeping a level head and assessing a situation before reacting with any rash treatment is so important. I’m relieved that I didn’t treat them with anything they didn’t actually need, even though delaying to assess the (perceived) damage made for some tense moments!